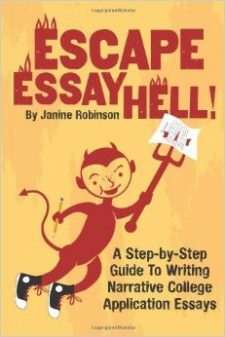 My third writing guide, Essay Hell’s 2016-17 Prompts Primer: Strategies for the Common App, UC and Other College Application Essays is another companion guide to Escape Essay Hell! since it helps students formulate original ideas and a writing plan to respond to specific prompts. It helps students learn to interpret and “spin” prompt questions and write their most powerful, meaningful responses. The University of California: all-new 8 prompts! ApplyTexas (the application for most public universities in Texas, including UT at Austin) All-new prompts Topics A,B and C! You can find it on Amazon here in paperback and Kindle ebook. Don’t have a Kindle? To purchase and download a digital version of Essay Hell’s 2015-16 Prompts Primer, click the button below. $4.98. You can read it right now!